Harsh “hate speech”, which turned out to be a mocking Facebook page. On 1 and 2 February 2018, multiple Macedonian media outlets published a shocking photo and informed that it’s a part of leaflets used to mobilize citizens in Greece to take part in the 4 February rally in Athens. TV ALFA: Brussels is silent about the hate speech and the burned Macedonian flag during the protests in Thessaloniki: “Meanwhile, new posters with horrifying images appear, such as the one with a soldier with the Macedonian flag on his hat molesting a woman, and the message is “Save Macedonia from the Slavs”. Media outlets and the general public felt disgusted by another one, which shows a big bloodthirsty bear – representing the comitadjis from “Macedonia”, as they were called by the Greek andartes. 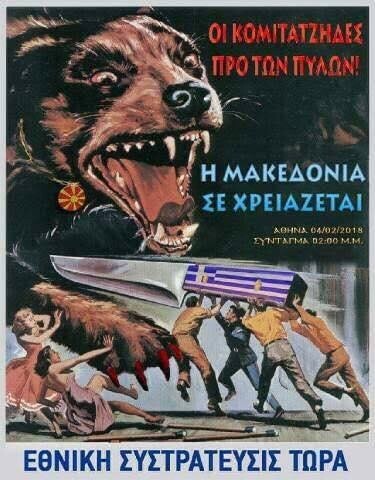 Showing the Greeks butchering the bear unitedly, it reads: “The comitadjis are at our doorstep – Macedonia needs you”. Fokus: “The comitadjis are at our doorstep” – call to participate in the protests in Athens. Sloboden pechat: Comitadjis at the doorstep: Here’s what the poster for the protest against Macedonia in Athens looks like: The official poster calls that “Macedonia needs you now”, because “Comitadjis have come at our door”. Initiators are members of a certain national strategy named “Now”. “Nationalists and neo-fascists in Greece made a shocking poster with which they call the people to participate in the 4 February protest with offensive content. The poster reads “Comitadjis are at our doorstep. Macedonia needs you. All together now”. The controversial image was published by other websites and influential media, and there were controversial posts on social media as well. 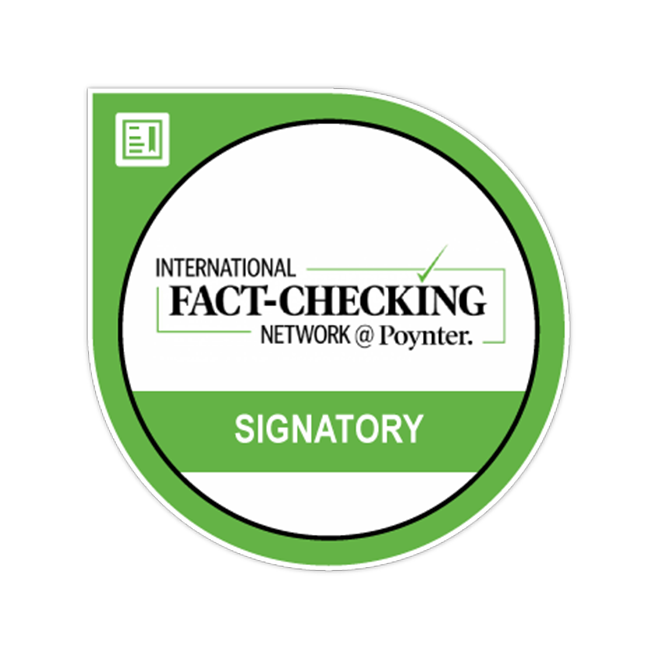 For instance, a well-known national TV editor wrote that “The Greek hysteria against Macedonia gains monstrous forms… This is a call for butchery – as opposed to the Macedonian’s gesture, to rename the motorway into “Friendship…”. Multiple intellectuals and journalists contributed to the sharing of the “shocking” photo on social media who also said that “this is the poster used to organize the protests in Athens”. Taking into account that the Macedonian media outlets were leaning toward hate speech, which calls on violence, I decided to check their story. I started by checking the published photo on Google Images, and the best result was the poster for the film Attack of the Puppet People (1958). After I read about the film, I realized that the poster was used as a model for the photomontage for which the Macedonian media claimed to be a leaflet that calls on political rally. But, has the photomontage really been printed as a leaflet? Has that leaflet really been handed to citizens or has been glued as a poster throughout Greece as the Macedonian media outlets suggested? To find the answer to these questions, I began a quest to find the source and author of the controversial photomontage. My search bore fruit after I read a Facebook comment indicating the following page as a “pranking” page that published the photomontage – Ελληνο-Χριστιανικό Ethnostedon (Greek-Christian Ethno-sedative). After I took a look at the page and saw the posts reactions, it was clear that this page publishes controversial photomontages that can be classified as “grotesque humor” and “social satire”. Moreover, it became clear that this page has posted numerous other photoshopped old propaganda posters. While looking at the photomontages, I was able to determine that the controversial images, shared by the Macedonian media (without naming the source), have been recently shared by this page, which had previously shared similar photomontages with the same model (old propaganda poster). For example, on 11 March 2014, they published the following photomontage (used the film poster as a model), cartooning Samaras as the safeguard from the communist menace. 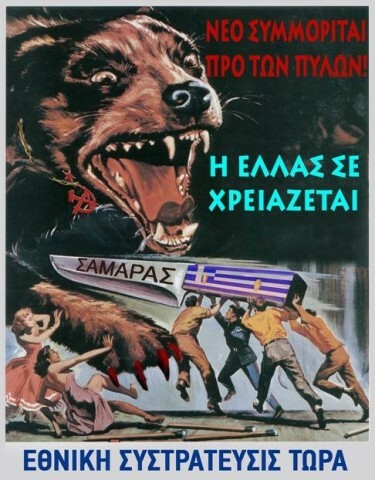 I also saw that another controversial photomontage, similar to the photomontage that was represented as a leaflet for the nationalist rally in Thessaloniki, but with a text that ridicules Samaras, was published previously (9 May 2014!). 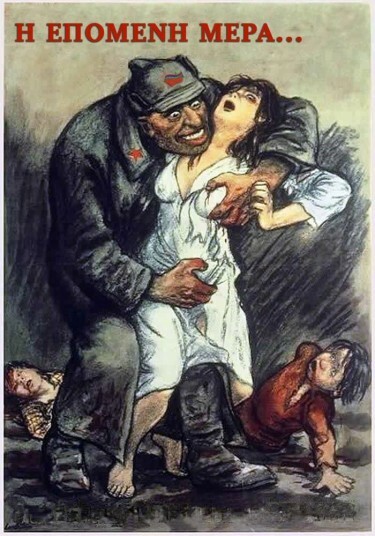 (Model for this photomontage is an anti-Bolshevik propaganda poster used in Poland in 1921). 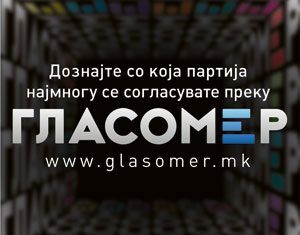 After I finished scrolling the page, I wrote a private message to the page admins to tell them that two of their posters caused backlash in the Republic of Macedonia, followed by information that these posters have been designed to mobilize protesters to attend rallies. Humor through exaggeration. I think It is obvious for the Greeks. We choose to show posters that overemphasize the nationalistic and relegious tedencies using a grotesque and oldfashioned background in order to deconstruct them. We are not nationalists we are just joking. Thank you for your interest and sorry if you feel insulted. (link to Attack of the Puppet People). How to explain the phenomenon that many Macedonian media outlets didn’t see humor in the posters, but hate speech instead? Although some comments on social media say that it’s a matter of “deriding with the extremists” and that “they are not real posters” but posters for “trolling the nationalists” (even as “an example of a sound irony”), such comments were welcomed with disbelief. As the commenter Spyros Sofos pointed out, maybe “the problem is we are so alienated from each other as peoples and as individuals that we are prepared to expect the worst in each other”. 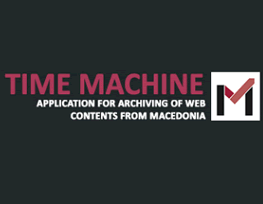 Probably the biggest part of the problem lies in the Macedonian media outlets who disseminated the paranoia regarding the Greek hate speech leaflets without doing their homework first. Their homework is to find the photomontage source, to verify whether it’s really a matter of rally “leaflets” or photomontages, and to try to interpret publisher’s context and intentions, before even starting spreading unverified “hate speech” speculations, which foment tensions, discrimination and hate. Another lesson from the “leaflet” (actually photomontages and Internet memes) affair is that using propaganda posters which contain elements of propaganda and hate for mocking is highly risky. The use of propaganda posters for mocking may remain incomprehensive, and can also serve as an incentive for mongering of hate speech or paranoia. If we paraphrase one wise thought by one convicted media owner “Too much humor”. For a long time, we’ve known that the Macedonian “journalism” hasn’t been immune to nationalistic paranoias and instigations based on speculations. We hope that this affair with the so called leaflets will strengthen journalists’ immunity, and that entails publishing an apology to the readers for all misinformation concerning the “leaflets”.